Wicked Anime brings you awesome animated commentary every other week! The time where you don your cardboard cosplay and empty your wallets on meaningless PVC figures while watching terrible AMVs. That’s right! IT’S CON MONTH! 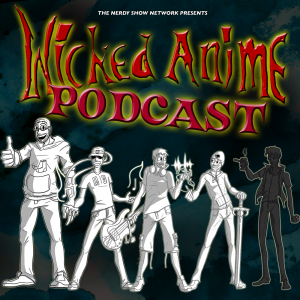 Join Wicked Anime as, for the next few episodes, we talk about what makes conventions so great to us, so terrible to the normies, and what drives our fellow nerds to crave that next hit of the convention hall! Join Jonstar, AFLM, Evan, and Greg, as they talk about what’s happening in anime and why we all crave the con floor! PLUS – What’s in the box?! What’s in the socks?! and What’s that person doing wearing a diaper?!!! Andrew’s newest Wicked Anime track! Jon is the Co-Creator and Co-Host of Wicked Anime, a video review show and bi-weekly podcast about anime and Japanese Culture! His nerd caliber goes far beyond just anime though, he is a movie fanatic, comic book collector, and real-life professional artist! When he's not editing video or audio, you can most likely find him at conventions, either on a panel or in the dealers room! The 50th fabulous episode of your favorite flaming podcast!